This is an adventurous tour, starting in Thailand and then moving through the mountainous northern provinces of Laos before finishing in Bangkok. Luggage transfer and vehicle support will be provided. The tour is suitable for fit cycling enthusiasts. Travel by cycle and by boat through spectacular mountain and jungle scenery, staying mainly in isolated villages, making it possible to experience the realities of village life at close quarters. Most of this beautiful country is relatively untouched by modern development and Western values. This is particularly apparent in the sub-tropical provinces in the north of the country. 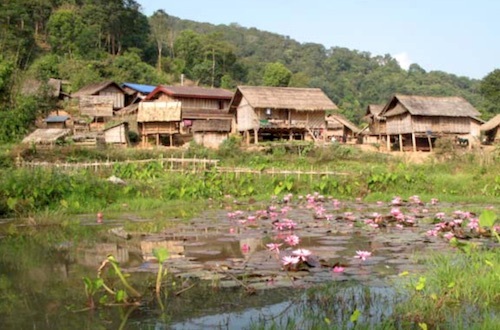 Here the diverse ethnic groups remain isolated from mainstream Laos by the mountainous terrain. Lost in time, their traditional way of life and culture is still intact. Due to the difficulties with taking bikes on airplanes, cycle hire is included in the tour. Fly from London Heathrow on Thai Airways flight TG911 to Bangkok, Thailand, departing 1150. Arrive Bangkok at 0615. Onward flight TG104 to Chiang Mai, departing 0830, arriving 0950. Chiang Mai is a former religious and cultural centre, known for its temples, markets and the many colourful hilltribes that live in the area. Twice coming under the control of the Burmese, there is a strong Burmese influence reflected in the architecture of the city. In the evening a chance to visit the night market where many of the hilltribe's handicrafts can be seen. Stay 2 nights. Morning ride to the old town, the temple of Vieng Kum Kam and numerous cultural highlights. After lunch, vehicle assist up to the hilltop temple of Doi Suthep, the most revered Buddhist shrine in the Chiang Mai region. On a clear day the temple affords an excellent view over Chiang Mai and its striking temple landscape. Cycle 30 km. Transfer by bus to the Chiang Rai Province, the northern most province in Thailand (approx. 2.5 hours transfer). Visit the revered Wat Rong Khun (The White Temple) before cycling to Chiang Rai in the heart of the Golden Triangle, the compact region where Thailand, Laos and Burma meet, offering a heady mix of cultures and landscapes. Cycle 55km. Stay 1 night. Cycle from Chiang Rai to Chiang Kong, on the border with Laos. Mostly flat with a few rolling hills, passing through tobacco and corn plantations. 102km. Stay 1 night. Boat crossing of the Mekong River to Houayxay, then a spectacular 4.5 hour boat journey down the river to Pak Beng. Stay 1 night. Cycle on quiet roads to Muang Houn. 51km. Stay 1 night. Continue cycling through Udomxai Province to Oudomxay. 93km. Stay 1 night. Cycle to Pak Mong. A hard day through the mountains, passing through Hmong villages. Two long climbs followed by an exhilarating descent. 82km. Stay 1 night. Cycle to Luang Prabang. A long day, but easy terrain. 112km. Stay 2 nights. Cycle to the beautiful Kuang Si Waterfalls, passing through a rural landscape of rice paddies and Lao Lum villages, returning in the afternoon to explore this facsinating place. For those up at dawn there is chance to witness the daily parade of saffron-robed monks receiving alms. 60km. A tough ride passing through spectacular limestone peaks, with two hard cimbs. 79km. Stay 1 night. An undulating ride followed by a long descent off the mountains to Kasi. 96km. Stay 1 night. Cycle to Vang Vieng, a popular stopover for backpackers. The location is quite spectacular, surrounded by mountains and limestone peaks. 52km. Stay 1 night. Cycle through local rubber plantations and small villages. After lunch, two hour bus transfer to Vientiene, the capital of Laos. In the evening you might enjoy a refreshing beverage and watch the sunset over the Mekong River. Cycle 60km. Stay 1 night. Free morning to explore, then cross over the Friendship Bridge into Thailand. Cycle 25km. Overnight train to Bangkok. On arrival in Bangkok transfer to the hotel. Later in the morning take a short walk to the Chao Praya River and board a long tail boat for a tour of the local canals. Visit the home of the Thai Royal family at the Royal Palace complex, followed by Wat Phra Kaew, home to the Emerald Buddha, one of Thailand's most venerated images. Another highlight is Wat Pho, the largest temple in Bangkok, housing a 46m-long, 15m-high gold-plated reclining Buddha. Stay 1 night. Travel from the hotel to Bangkok airport for Thai Airways flight TG916 to London Heathrow, departing at 1320 and arriving at 1935. Accommodation on nine nights will be in 2- or 3- star star hotels, usually with en-suite facilities. One night is spent on the overnight train to Bangkok. Other nights will be spent in guesthouses, some of which have basic facilities only. Rooms are based on two people sharing. Breakfast will be included throughout, with sometimes taken in local restaurants. Vegetarian food is widely available. An air conditioned support vehicle and a vehicle for the transfer of luggage will accompany the group on all moving-on days, except for the journey completed by river boat. EU citizens must hold a passport that is valid for at least 6 months at the end of the tour. A visa will be required for Laos but not Thailand. At present the cost is $35 on arrival, and you require a passport photograph. Holders of non-EU passports are advised to check whether or not they require a visa. There are no compulsory vaccinations for foreign visitors although it is strongly recommended that you are vaccinated against Typhoid, Tetanus, Polio and Hepatitis A and B. You should contact your doctor at least 3 months prior to travel to obtain any vaccinations and the latest advice to travellers. The price of £2,900 is based on a minimum number of 8 people taking part in the holiday and is calculated at a rate of $1.26 to £1 sterling (based on exchange rates published on www.x-rates.com on 13 December 2018; please note Booking Conditions, clause 3). If there are insufficient bookings by 24th August 2019, we will contact you and return all monies paid, although in certain circumstances the holiday may still run at below minimum numbers but at the same price. A deposit of £800 per person is payable upon booking, with an Interim Payment of £500 per person due by 1st July 2019. The final balance of £1,600 per person is to be paid ten weeks prior to departure, by 24th August 2019. Emerging from enforced seclusion under a Communist regime, Laos is currently Asia’s newest and most unspoilt tourist destination. The entire country boasts a population of less than 6 million and, outside of Vientiane and Luang Prabang, most live in villages comprised of clusters of bamboo huts without running water or electricity. The mountainous terrain of the northern provinces has helped to preserve the culture and primitive lifestyle of the many ethnic groups. The scenery is diverse and spectacular at times. Crossing the Mekong from Chiang Khong in Thailand, enter Laos at Houayxay then embark on a spectacular boat journey down the Mekong river to Pakbeng. From here cycle north east to Udomxai, passing through lush jungles and small villages. Take a break from cycling at Luang Prabang, a UNESCO World Heritage Site, considered to be one of Asia’s most beautiful towns, to explore the exquisite temples and the interesting night market. From Luang Prabang cycle south through dramatic karst scenery to just south of Vang Vieng, then vehicle transfer to Laos’ capital city, Vientiane. The trip finishes with an overnight train ride to Bangkok and a chance to explore this fascinating city. This is hilly terrain with several tough ascents. The cycling will be from village to village on small roads with very light traffic. The roads are mostly surfaced, but poorly maintained, and there may be short stretches of unsurfaced roads. An early start will help to avoid the heat of the day. Participants will cycle in groups of similar ability, regrouping occasionally; it is not practical to ride as one group. A support vehicle, carrying clean water, will never be far away; it will also be available in an emergency should anyone require assistance or need a day off the bike. As this is an adventure tour in a third world country, almost untouched by western values, where the majority of the population live a comparatively primitive life style, thus you should be prepared to rough it at times. While passing through small villages you will be exposed to the reality of village life. Outside of Thailand, Luang Prabang and Vientiane, the guesthouses and hotels used will vary in quality and facilities. The best have clean flush toilets and hot showers; others provide buckets for washing and shared toilet facilities. Mineral water will be available throughout the tour. The maximum number of participants will be 13 excluding the Tour Manager(s). It should be hot and dry, with daytime temperatures around 30C. For most cycling days shorts and light layers will be adequate, although an additional layer may be needed for descents and early morning starts. Adequate sun protection is essential. Casual wear can be worn in the evenings. Modesty is expected in towns and temples; ladies should cover their legs and shoulders when not cycling, and shoes and socks are always to be removed when visiting any religious sites. Cycle hire is included in the tour price. You are advised to bring your own helmet, pedals, shoes, gloves, eye protection and cycle clothing; tool kits, pumps and mechanical assistance will be provided. Allocation of individual bikes with correct frame sizes will take place closer to the tour departure date. Helmets are advised, though are not mandatory; if you do not intend to wear one, please check that your insurance will cover you in the event of claim. You will not need to carry luggage, but a saddle bag, frame bag or seat-post bag will be useful for carrying wet weather gear, spare clothing needed for the day, camera, snacks and your map. As the roads are few, navigation is simple, so detailed route descriptions will not be necessary, but you should carry a map in case you become separated from the group. Maps are available in the UK, but village names vary between maps. A suggestion would be the Lonely Planet Road Atlas to Laos ISBN 1-86450-102-2. Money - There will be very few opportunities to spend money other than in Chiang Rai, Luang Prabang and Vientiane. Mineral water, lunches and snacks should cost no more than £5 per day. Allow approx £5 per day for evening meals. Thai Bahts can be obtained via Thomas Cook and Post Offices in the UK. Laos Kip is obtainable on entry into Laos at Houayxay.